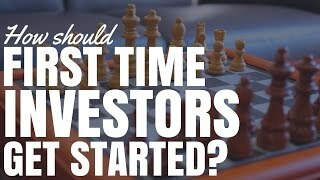 How Should First Time Investors Get Started? How Should First Time Investors Get Started? How Should First Time Investors Get Started? How should first time investors get started? Should they save a deposit, use vendor financing, do a joint venture or something entirely different? How should first-time investors get started in the property market? Should they save their own deposit? Go to the vendor finance route? Go into a joint venture? Or use some other strategy? Hey! I am Ryan from OnProperty.com.au, helping you find positive cash flow property and this question was asked by Gordon. Thank you Gordon for sending in your question. If you want to have your question answered, just email it to Ryan@OnProperty.com.au. So when you are a first-time investor, it could be very difficult to get into the market. It could be extremely expensive to get into the market and you feel like you are trying to save, but it just takes forever to get there and you are not making any progress. So, is there a better way than saving your deposit? Should you look at joint venture? Should you look at vendor finance, etcetera? Or should you just stick with the staple approach of saving your deposit? I cannot answer the question for you, but I can give you some pros and cons and things to think about with each of them. The most common way to get into the market is obviously saving your deposit yourself. This can be difficult. Saving a deposit even if it is 5% plus cost, or maybe 10% of the purchase price; if you are purchasing a $300,000 property, that is $30,000. A $500,000 property, that is $50,000. That is a lot of money to save. In some cases, that might be a year or more worth of your wage, which can be extremely difficult to do. So, the negative with saving your deposit is obviously that it can take a great deal of time. It involves an extreme amount of discipline to not go out there and not buy the latest iPhone, or not buy a car on a loan, or not purchase the latest thing that you want to purchase. It takes an extreme amount of discipline to be able to do that. A large portion of my audience that does have that discipline, but I am sure there are some of you out there who just really struggle with that, and that may be unachievable for you. So, the negative of it is it can take a lot of time to do. The positive of that is you then have full control. You can purchase a property yourself in your own name or in a trust if you decide to go down that route; but you have the deposit. You are investing it for yourself. This gives you full control over your decisions: what suburbs you want to invest in, what type of property, how much money do you want to spend, are you going to do a renovation, what are you going to put the profits towards, etcetera, etcetera. So, when you purchase a property it means you get full control over it. You are the decision-maker. You can make whatever decision you want. That is a huge benefit to it. It can be beneficial going into yourself rather than going in something like a joint venture when it comes to buying property number 2 and 3 and things like that because the banks will look at the entire loan against your income. So, it can negatively affect lending in the future if you do a joint venture. Saving a deposit is probably ideal in most situations if you can actually go about and save the deposit. Hopefully after then you can do something to that property to improve it, to increase the equity on that property, and then maybe in the future you may be able to borrow against the equity to go again because it can be difficult to save a deposit over and over. So, Option number 1 is to save a deposit. Option number 2 is what is called vendor financing. Now, this is quite common in places like the USA; not as common in Australia but still possible, I think, in almost every state. You might need to double check; I know there are some rules about this agreement in South Australia, so definitely check there. But just check with your local state laws whether or not you can do vendor financing. So vendor financing works like this: the person who is selling the property provides you with the property, but rather than you going and getting a loan from the bank and then paying those people in a lump sum, or basically you pay your deposit, the bank pays them the remainder of the sum; what is actually happening is that the person who owns the property is extending a loan to you. So you may still give them a deposit, it may not be as large, it might be just as large, it depends on the agreement you create. You give them a deposit and then they extend a loan to you based on how much you purchased the property for. So let us say a $500,000 property, let us say we give a 5% deposit of $25,000; you then owe that person $475,000. They will then create a loan structure which will be paid off over X number of years at X percent. So vendor finance can be beneficial because if for some reason you cannot get a loan from the bank, vendor financing may be your only option to get a loan. That is good in that aspect. It can also help you if you have a smaller deposit. Some people will accept smaller deposits for vendor financing. The negatives of vendor financing is that you are likely going to overpay for the property. So you are going to pay more than the property’s worth, which means you need to do something to grow the value of that property or you need the market to go up just to catch up with what you pay for the property. So generally, you are going to overpay because you are not in a position where you can pay cash or you can get your own bank loan and the bank pays cash for the property. Generally, you also pay above average interest rates. So if you can go to the bank today and get probably somewhere between the 4% or 5% interest rate, you are going to need to add 1%, 2%, 3% to that. So rather than 4% to 5%, it is probably going to be somewhere between 6% and 8%, so you are going to be paying a high interest rate for the property. This kind of makes it difficult for me because the numbers do not tend to stack up the higher the interest rate becomes. So if you can get an interest rate of 4%, so many properties are positive cash flow it will look great on paper; as soon that goes to 7% or 8%, it does get hotter. So when you go vendor financing, the numbers might not stack up as much especially if you are paying more for the property and you are paying a higher interest rate and you are not putting down as much as a deposit; so you could be negatively geared there, which maybe a negative for you. But it may mean that you can get into the market earlier. Another thing to think about when it comes to vendor financing, aggressive is the wrong word but very assertive, very proactive in terms of finding these vendor finance deals. You need to go out there. You need to make offers on a bunch of properties. Most people have never heard of vendor finance, so you need to explain it to them. You may be dealing with the real estate agent, you need to craft emails that will get passed onto the owner and explain in a good way. Generally in an area where that property is going to turn over and sell quite quickly unless you are willing to offer a decent amount more than what the property is worth, people will probably not consider it. So expect to be knocked back a lot of times. Expect to do a lot of work for just one person who is going to say yes to a vendor finance deal. The other option you could look at when you are investing for the first time is to actually go into a joint venture. So this is where you partner with someone else; you can buy new deposit, you can buy new incomes so that maybe separately neither of you could get a loan nor afford a property. But together, you can go ahead and purchase a property and afford it. There are pros with this. Obviously, you can get into the market. You are not overpaying for the property or overpaying on interest rates like with vendor finance. You can start getting growth on that property. Negatives with this is that obviously, you need to work with someone else so there are going to be compromises along every step of the way basically because it is very rare for 2 people to exactly agree on one thing. Obviously, you need to draft up contracts and things like that to ensure that money is handled correctly, profits are handled correctly as well. And another negative with joint venture is that when you go to borrow again, maybe you want to buy a property by yourself next time, the banks will assess you both as having the entire mortgage. So even though you might only be responsible for half of the mortgage, you are probably liable for the entire mortgage. So what this means when you go to get a loan the bank is going to say, “Okay, you co-own this property that is worth $500,000 or has a loan of $500,000 with this person. We are going to assess your borrowing capacity based on assuming that $500,000, you are responsible for the entire thing.” And this is in case your partner disappears to live in Cuba and never pays the rent or never pays the mortgage again, then that mortgage is left with you. So there is a risk there that you may have to pay that full mortgage in the future. So this can negatively affect your property portfolio moving forward. I guess the solution to this would be short-term joint venture deals. Maybe you could go in with someone, do a renovation, sell the property in a certain amount of time. And that would then clear that co-debt that you have together and put you in a better position. I am not a mortgage broker so do not take this as mortgage advice. Always go and see a professional mortgage broker when making these decisions. So, so far we have covered saving your deposit. We have covered vendor finance. We have covered joint venture. The last one that I want to cover is equity in your home. So if you own your own home and if the home value is higher than the debt that you have on the loan, the gap between what the house is worth and what the loan is, that is called equity. And often, you can draw against the equity in the house; use that as security to get a loan. You then get that cash out; you can use that cash as deposit for your next property. Get another loan for that second property. So there is always the potential if you already own your own home that you could potentially draw equity to speed up the process in terms of buying your own home. You may want to draw 20% for a deposit for the home. You may have some saving that you want to combine with equity in order to purchase an investment property. It really depends what your situation is, how much equity you have, how much savings you have, whether you decide to go down this route. Now, the positives of this is that you do not need to save your deposit, you do not need to joint venture with anyone. It is generally pretty standard to do this, so when you are purchasing a property you are not going to have to overpay, you are not going to have to overpay in terms of interest rates, so that is a positive there. You are going to buy it in your own name, so you have full control there. You do not have all the negatives that come with something like vendor finance or joint ventures. But the negative that you do need to consider is the equity that you borrow, that then increases your debt value which means it increases your payments as well. So when doing your calculations, even though you may be using 20% equity to purchase a property, you kind of need to assess that property based on a loan of 100% or 100% plus cost because you are getting that money in a form of a loan, your interest repayments are going to go up so you just need to factor in that financial commitment and that cash flow commitment and whether or not the property that you are going to purchase stacks up and makes it worthwhile. So Gordon and everyone else, I hope that this has given some insight into how first-time investors should get started. Obviously in an ideal world, we could just quickly save our deposit, click our fingers and the deposit would be saved. But we do not live in that world. Some people can save a deposit. Some people find it more difficult than others. If you find it more difficult, you can explore vendor finance. You can explore joint ventures. But obviously, they do come with their pros and with their cons. You can also consider using the equity from your own home. However this requires that you already own your own home, which a lot of first-time investors might not actually have. So at this point, I want to wish you the absolute best in your investing career. I wish that you can go out there, that you can purchase your first investment property and I wish you great success with that. If you want help in researching an area to find a good property in, so you are in a position where you are ready to purchase but you do not know what areas you should be looking at; I do have a paid course that will show you in-depth how to research an area, to understand whether or not that area is likely to be a good area to invest in. Head over to OnProperty.com.au/research to check out that course. It is going to add a lot of value to your life. I have a bunch of people go through that course, a bunch of my members go through that and use a lot of those techniques to research an area; so very useful, it can help you avoid bad areas. Again, check out OnProperty.com.au/research in order to get access to that course. That is it for me today guys! Until next time, stay positive!